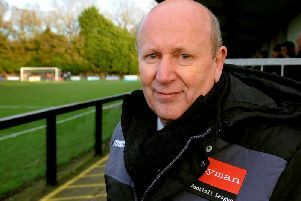 Oakwood manager Mark Gilbert was not critical of his side, despite their routine 3-0 defeat by second-placed Varndeanians. A 15th minute goal by Oliver Stevenson was added to in the second half with goals by Andrew Pearson and Matt Waterman. He said: “We didn’t expect a lot out of the game as all their players are quality. “The first half we did well and had four or fives shots. “They scored a goal with a scissor-kick which looped into the top corner and we were disappointed to go in to half-time at 1-0 after that type of goal. “In the second half we came out not awake, Varndeanians scored two more goals. “We put a shift in and 3-0 against them is quite respectable. “Our centre-backs Shane Saunders and Sam Gallagher and goalkeeper Jack Stratton performed well. Oakwood return to Tinsley Lane this Saturday, December 8 when they host 15th-placed Worthing United.